Two more blocks done! Yesterday it cooled down a little for the early part of the day. By evening it was in the high 80s again but the humidity didn't seem as bad as Saturday. Now today and tomorrow its supposed to be in the 90s again. Between the mosquitoes and the heat, I'm ready to stay inside and sew. Beautiful blocks! I hope it gets that warm here, but I can do without the mosquitoes. You know I love your color choices, and Kaffe, but this is beyond yummy. I'm going to watch the progress here, maybe I'll put away my WIP and get this on the design wall. Know what Sewing Junkie's sayin about migraines, this time of year is a killer for me. I hate mowers, the sound of one cranking up makes me cringe, and it seems like it's every day!! But then back to my air conditioned sewing room, pure bliss. Pretty blocks. It's still quite cool here so I am doing my garden but when it gets hot I prefer to stay inside too. pretty blocks to play with - between the heat and the bugs I have stayed in the house a lot the last couple of days also. Gorgeous blocks! As you sit and swelter we are enjoying temps 15 degrees below normal. I'm sure it won't last much longer and we will have the summer inferno. Damn, you are just GOOD. Bottom line. These, these I love. Great way to start the day. Beautiful blocks! I love your use of fabrics! We are having hot, humid weather too. But I am going out to plant a few things anyway. Beautiful blocks, I like your colorful blog :-)Greetings from Slovakia! Your blocks are so pretty, as usual. I like this pattern, alot! Hot, Hot, Hot!!!!! It's been over 90 here for a record breaking number of days now. We usually get a few days this hot later in the summer, but nothing like this. Your flowers are so pretty. I just Love these blocks! Can't wait to see how it progresses. Love your blocks so much! Very yummy!! GREAT blocks! Can you share the pattern? The weather really is awful. I take my walk early in the morning and come home dripping in sweat. Re: Heat - we've broken two records (1 over 100 years old) in three days and today looks like another record breaker. Temps at 99 with heat index over 105 during the first five days of JUNE?!?!?!? Love the look of these blocks! I am loving these blocks and your fabric choices. We've been over 100 for several days now. Summer started. 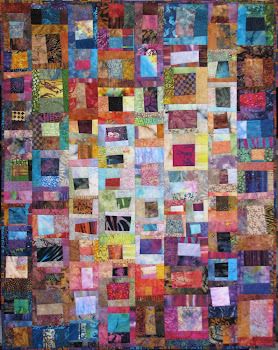 Beautiful blocks and love your colors. Yes today was a good day to sew indoors. I just went outside to fill my Orielo feeder and it is really hot. My therometer is reading 91 at 5PM. Tomorrow to be the same so will get more sewing done. I hate to see the electric bill this month. Love the Kaffe target blocks and what you're doing with them. I'm hoping the mosquitos die out soon. Bug dope is not my favorite scent! I love those blocks! I wish it was that warm here. Really love the blocks! As usual, your color sense takes my breath away. 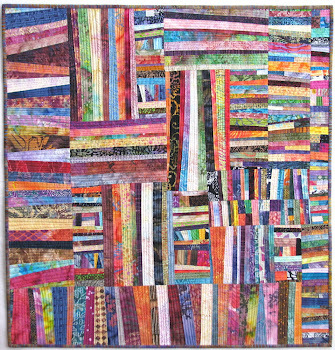 I'm looking forward to seeing what YOU decide to do, I have been impressed by your judgment in other quilts. Wanda, this quilt is going to be stunning! Can't wait to see these with the sashing blocks. I'm loving these blocks. I'm not a huge fan of log-cabin blocks, but as a square-spiral they're fun!